Updated November 26, 2015 at 11:00 pm: A follow up article by Jennifer Pagliaro includes reactions from Mayor Tory. My comments appear at the end of this article. The Toronto Star’s Jennifer Pagliaro reports that the Building Industry and Land Development Association (BILD) will challenge Toronto’s planned increase in Development Charges for the Scarborough Subway Extension (SSE) at the Ontario Municipal Board (OMB). [BILD is] challenging the planning foundation for the three-stop subway — which council controversially approved last term over a seven-stop LRT that was fully funded by the province. BILD is raising red flags about the city’s ridership projections. “The ridership numbers that we have demonstrate that what’s needed in that area is light rapid transit,” Tuckey, whose background is in city and provincial planning, told the Star. This action has implications well beyond the Development Charges (DCs) for the Scarborough Subway and touches on the whole question of transit financing and planning that for years has been more about political gamesmanship than about the actual needs of the City of Toronto. We know that the development industry does not like paying one cent more than they have to, and preferably less, in taxes. In that sense they are no different than other taxpayers. However, while homeowners can only express their opposition by voting for politicians with vague promises to fight waste at City Hall, and hope that their “champions” like Ford and Tory will “do right” by them, their only real recourse is at election time. Elections are fought on signature platforms like SmartTrack and “Subways Subways Subways”, and voters don’t get to cherry pick the platform lines they really want. Elected politicians claim they have “a mandate” when their victory may simply depend on “not being the other guy”. Development Charges, on the other hand, have specific rules about how they are calculated and an appeal mechanism neither of which is available for general property taxes (or many other taxes Council can or could levy of which the Land Transfer Tax is one obvious example). As the Star notes, most of the City’s share of the SSE ($910m) will come from the subway property tax yielding $745m. This tax will rise to 1.6% in 2016 and then stay on tax bills for decades. The amount coming from DCs ($165m) is much smaller, but developers have an appeal option through the OMB. Lost in all the debate about the TTC’s Operating Budget and fare increases for 2016 was the approval of the 2016 Capital Budget and 10-year plan out to 2025. There wasn’t much debate because the Board was worn out from the fare issue, but a few comments were worth noting before a very perfunctory approval of a $9-billion budget. This is a very big, complex budget (see my previous article for some details). The Board only knows about it at the broadest possible scope – the really big projects and the major “state of good repair (SOGR)” budget lines – but there’s a lot more under the covers. For the gory details of each project’s actual content and purpose, one needs to read the two-volume “Blue Books” which have not yet been published for the 2016 cycle. In past years I have included extracts from them in articles to give background info. The Board members will each get a set, eventually, but one requires a strong constitution to read through the equivalent of two Toronto phone books. Having done this for many years, I have the advantage of needing to look only for what has changed, but someone coming to this as a novice wouldn’t make it even part way through the first volume before the amount of detail bored them to sleep. I do not expect my readers to look at every line of the budget, nor do I expect this of the Board members. Even I do not read every line. One of the big challenges to a reader is knowing which parts to look at first: big ticket projects, projects that have a high profile, projects which, from past experience, are worth keeping an eye on. This takes experience, and TTC Board members don’t have the time to acquire it, let alone a guide saying “start here”. There is no trail of cookie crumbs through the budget forest. To their credit, the Board agreed with a proposal by Commissioner Joe Mihevc that they should do a “deep dive” into capital plans in 2016 before the 2017 budget cycle starts. How far down they will get depends to a great deal on how well TTC management can package the budget in a way it can be clearly understood without undue simplification. This really is an iterative process needing a broad view, and then deeper passes through the details highlighting critical parts of the budget. It is not a session for a Councillor who only cares about his pet project and queries every penny in every other budget line as if it were a waste of previous taxpayer dollars (i.e. not being spent in his ward). After a long, rambling, and less-then-well-informed debate, the TTC Board has approved increases in selected fares for 2016 at its meeting of November 23, 2015. Adult cash fares will rise from $3.00 to $3.25. Adult tokens will rise from $2.80 to $2.90. Metropass prices (all classes) will not change. Student and senior fares will not change pending the outcome of a study on Fare Equity that will report early in 2016. The cash fare last changed in 2010, while the adult token fare, then $2.50, will have gone up $0.40 by 2016. Freezing the Metropass prices will have the effect of lowering the “trip multiple”, the ratio of the pass price to the token fare from 50.5 in 2015 to 48.8. For monthly discount plan (MDP) subscribers, the ratio will fall to 44.7. The multiple is even lower for those who can claim the transit tax credit pulling it down to 38 for MDP users. This is only available to people with taxable income against which the transit credit can be applied. This will make the pass more attractive to riders who now feel that it is priced beyond their normal transit usage level, and of course will provide a fare freeze for all existing pass users. The gap between the adult and senior multiple will now be wider because seniors’ fares have not changed leaving the ratio between passes, tickets and cash fares as they were in 2015. The unfocused debate can be blamed directly on the TTC’s own Budget Committee and its failure to actually discuss fare policy beyond producing a range of options for consideration by the full Board. Absent a clear idea from Mayor Tory or the City’s own budget process of subsidy that the TTC might receive in 2016, debates about “fares” turn into efforts to minimize the subsidy call against the City where “fighting taxes” takes priority. When the issue reached the full Board, any idea that the TTC could magically survive without more subsidy had evaporated, but we still don’t know what will actually happen to fares or service if Council fails to deal with the TTC’s shortfall. By the end of the meeting, there were several overlapping motions on the table, the product of many Board members each cooking up their own version of an appropriate new structure and policy framework. By Vince Crisanti: That student and senior fares be frozen pending the outcome of the Fare Equity report in 2016. Carried. By John Campbell: That a revised fare structure (see below) be implemented including a $0.20 jump in the adult token fare. Defeated 10:1 against. By Shelley Carroll as amended by Glenn De Baeremaeker: That staff report back on a common fare multiple for adult, senior and student passes. Carried. By Alan Heisey: That TTC and City Transportation Services work together on improvements to enhance transit service especially for special events such as subway shutdowns, and report to the Board in six months. Carried. By Joe Mihevc: That all seven options for service enhancements be approved. Defeated 8:3 against. By Joe Mihevc: That the three options not approved by the TTC Budget Committee (Subway service reliability, three minute service on Line 1 YUS, Cherry Streetcar) be referred to the City Budget Committee for consideration. Carried. By Josh Colle: That the TTC and Toronto Parking Authority study means by which parking revenue can be maximized with a report to the Board in 3Q16. Carried. By Josh Colle: That the TTC examine ways to increase non-fare revenue and reduce office space costs through consolidation, and that staff report by 2Q16 on annual and long term revenue targets. Carried. By Ron Lalonde as amended above: That the TTC adopt fare scenario 7 with no Metropass, student or senior fare increase ($0.25 more on adult cash fares, $0.10 more on adult token fares). Carried. The combined effect of these decisions leaves the TTC with a $41-million gap between its proposed budget and the 2015 subsidy level. Considering that they are not even sure of getting that much when the first cut of the City’s 2016 budget is launched on December 15, 2015, this leaves Council facing an 8.7% increase in the main TTC operating subsidy request and a similar increase (although a smaller dollar amount) for Wheel-Trans. When the final text of these motions is published by the TTC, I will update this article. Updated November 26, 2015 at 2:30 pm: The TTC will be conducting a “Meet the Planners” session at George Brown College on Dockside Drive on Tuesday, December 1 from 2:00 to 4:00 pm. There has already been a similar session at Pape Station. 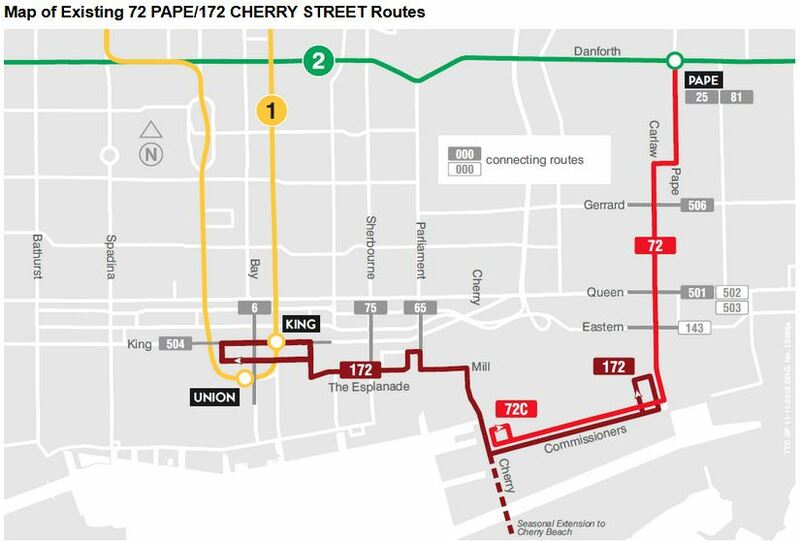 Route 172 Cherry was split off from 72 Pape a few years ago due to congestion from construction at Union Station. The question now is how to put the routes back together again, or indeed, if they should be in their original form. The TTC has a survey active on its website until mid-December 2015 to poll riders on proposed changes to service mainly in the eastern waterfront. This arrangement provides a fairly large loop through downtown and acts as a parallel service to the 504 King car for riders along The Esplanade and in the Distillery District. It was particularly useful during the recent Pan Am Games when service here was substantially improved because the route served the Athletes’ Village. However, the connection between the 72C Pape and 172 Cherry services is not good. It is not a scheduled connection and the two routes operate on different headways. Moreover, the Port Lands is not exactly the best place to connect between routes at night or in bad weather. Splitting the routes also effectively eliminates a direct link from the Danforth subway to Queens Quay East and the Distillery District. 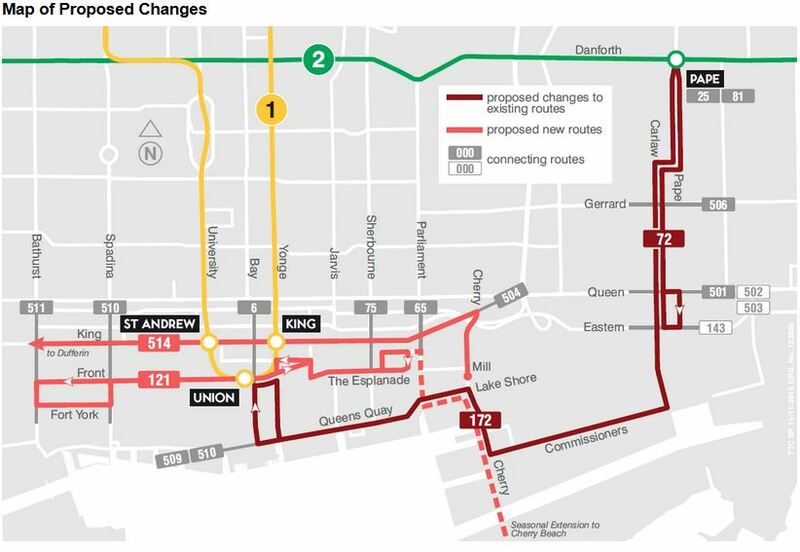 Route 72 Pape would be confined to the shuttle between Queen and Danforth, with route number 172 belonging to a revised Cherry bus that would operate via Queens Quay rather than using The Esplanade. The 172 would loop via Bay, Front and Yonge. It is unclear what the service level on 172 would be or whether this would be blended with the 72 Pape bus on the common section. A new route 121 would operate on Front and The Esplanade between Parliament and Bathurst. Service to the Distillery District along Mill Street would cease to exist, and the Distillery District would only be served at a distance by the 172 Cherry bus on Lake Shore and by the new 514 streetcar on Cherry itself. The 514 car would operate from Dufferin Loop via King to Cherry Street, although given TTC scheduling, many of these cars could well short-turn without serving the outer ends of their route. The 514 is less a new service for Cherry than a supplementary service for King, although this is not how it was presented in the 2016 Operating Budget. Indeed, provision of this map could have informed the discussion about streetcar service on Cherry considerably more than the way it was presented as a small spur off of King that would attract no new riders. The survey itself is interesting because it asks, among other questions, whether this route structure would encourage people to use the TTC more. What is missing is a direct question about whether this arrangement is more convenient, not to mention any indication of service frequencies on which any discussion of “convenience” inevitably turns. There is a big difference between a line on a map and whether service is worth planning on and waiting for. One obvious question is whether the new routes – 172, 121 and 514 – would become part of the 10 Minute Network. The primary service to GBC, the 6 Bay bus, loads diagonally opposite from the likely stop for the 172 at Bay and Front. The option of taking whichever bus shows up first is not available to riders. Similarly, westbound from GBC to downtown service would not use the 6 Bay stop within the loop at the college, but would speed past likely using the stop on Queens Quay well west of Sherbourne. Looping through Dockside Drive in both directions, and a revised loop at Union Station should be considered if this is to be advertised as an “improvement” to GBC service. The 121 bus as an alternative to the streetcar service on 509 Harbourfront only makes sense if it is quite frequent and reliable, not if this is a one or two bus shuttle showing up now and then for whoever happens to be passing by. This is a good first attempt, but more thorough community feedback is needed than just this survey, and the TTC has to be more forthcoming about how each neighbourhood along the proposed routes would be affected. The matter is complicated by the fact that the actual subsidy that will be made available to the TTC by City Council will not be set until early in 2016, and the TTC will compete with other agencies for available money. Although the Operating Budget report is long, it is better organized than the previous version with more detail, rather than depending on whatever questions might arise from a long PowerPoint slide deck and the skill (or lack thereof) of the presenter. A political imperative to “keep taxes down” and limit the growth of the TTC’s call on City subsidies from the property tax base. This often manifests itself in calls for “efficiency” year after year in the hopes that the TTC can do more with less funding in constant dollar terms. A political will to keep riders happy with benefits such as controlling growth in, or even freezing fares while providing more and better service. This includes targeted fare changes to benefit groups who are perceived to be more deserving of support through lower fares. Annual increases in the cost of labour, materials and utilities. The cost of additional service to handle demand from a larger population and a shift to transit from other modes. In 2015, Council approved an extra $95-million for a number of improvements to service, elimination of the fare for children, and a capital-from-current purchase of 50 new buses to be used for new express routes in 2016. This increase only covered the part-year cost of the changes, many of which came into effect only in recent months, and additional subsidy will be needed in 2016 for the full 12-month cost. Additional improvements are on the table as part of the 2016 budget, and some of these were approved in the Budget Committee. The bottom line here is that improving transit has an ongoing cost and is not something to be done on a one year “feel good” program followed by a return to penny-pinching. Indeed, even that $95m might not have come to the TTC had Council been aware of unexpected costs from changes in Provincial funding arrangements for other programs that came to light after the extra transit money was announced by Mayor Tory and TTC Chair Josh Colle. Waterfront Toronto, together with the City of Toronto and the Toronto Region Conservation Authority, are conducting several studies that will shape the future of Toronto’s eastern waterfront for decades to come. Recently, they held a series of open houses to outline the current status of their work and to solicit feedback. The materials from these sessions are available on the Port Lands Consultation website, and you can provide feedback through the “Discussion Questions” links. This article deals primarily with the transportation component, given this site’s focus, but with some introductory material to set this in context. Illustrations here are taken from five sets of display panels. Note that these are large pdfs. A planning framework for the multi-decade redevelopment of these areas into the fabric of the city. A transportation and servicing master plan. A precinct plan for a new community to be called “Villiers Island”. Metrolinx is running a survey of “fare integration”, whatever that might mean to you, until November 30, 2015. 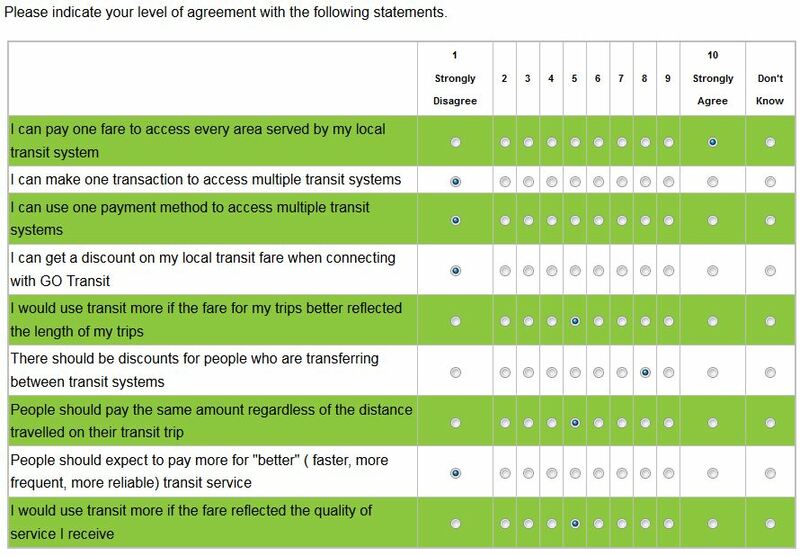 This survey is striking in the way that it reinforces options and viewpoints commonly seen in Metrolinx analysis of fare systems. It is quite 905-centric both in the types of questions and options, and the view of how people might use a transit network. The survey begins by asking about someone’s “typical trip” to establish an origin-destination pair. Of course, many riders within the city have many regular destinations, especially when their travel (like my own) is not dominated by commute trips to work or to school. After one gets through that section, another comes up asking about non-commute trips but with no attempt to quantify them or ascertain where they might occur. Cross-border and multi-carrier travel figure prominently in the survey, something by which, self-evidently, a regular TTC rider using only that system is not affected. The following list of fare options reappears in different guises elsewhere in the survey. As a piece of design, it fails because some questions are in the “I can …” format while others are “would” or “should” questions. It is unclear how an “I can” question can have anything beyond a “yes” or “no” answer. Does Metrolinx want our opinion on paying one fare for all of a local transit system, or asking if I can already do this? There is a big problem in that some options interact, but there is no provision for this. Metrolinx is obsessed with the idea of paying more for “better” service which could mean anything from a GO Train or a Highway coach, to a local express bus, the subway or even a new LRT line. One might agree with a premium for the GO train (although that would also relate to distance travelled), but not for other types of service. There is no option to distinguish between these. The ideas reappear as a list of challenges to transit travel. For a monthly pass holder, many of these options don’t really apply although one could certainly complain about the cost (high fare multiples) and the fact that on some parts of even the TTC, transfers can be a big headache thanks to unreliable service. Another set of options requires the choice of a top three issues and ranking them rather than using the 1-to-9 scale for all of them. Later the survey asks about co-fares between systems including local-to-GO and local-to-local transfers, but is silent on the question of how new co-fares might be funded, indeed on the whole question of regional fare revenue and subsidy sharing. Similarly, questions about distance or zone-based fares give no hint of what the effect might be for different journeys. Time based transfer and return trip privileges are nowhere to be found, typical for Metrolinx that only grudgingly acknowledges them as an option within local systems, not for the network as a whole. No doubt the results from this survey will be trotted out to support whatever fare scheme Metrolinx comes up with, but it could be strongly biased to “typical” Metrolinx riders who have a very different view of the transit world and fares than their (much more numerous) “local” network cousins. It would be amusing to see what a similar survey carried out for the population within Toronto would yield. The survey includes a request for one’s postal code, and so at least there should be some idea of the distribution of responses across the GTHA. TTC Board meetings (not to mention meetings of various Committees of Toronto Council) often entail a series of presentations by members of the public. In Toronto parlance, these are “deputations”. Some of these are entertaining, some are heartbreaking, and some are, let’s face it, an ongoing soapbox for a few regulars who can be counted on to show up at every meeting. I used to fall into that category, at least until I got my own much larger soapbox with this site. It is no secret that some members of boards and committees regard this as a huge waste of time. It is common to see many of them wander out of the room, hold press scrums, consult their email, and generally ignore what the poor, ignorant public might have to say. Moves to restrict speaking time, normally five minutes, to three, or to limit a speaker to one presentation regardless of the number of items they might wish to address, are not unusual. They are also wrong, very wrong. The Budget Committee meeting was not the best-organized or well-informed of TTC meetings thanks to a combination of factors. It was held in the boardroom at TTC headquarters which is no longer configured suitably for such events and cannot handle a large presence by the media who were out in force anticipating a story about 2016 fares. Almost all of the material was presented by one person who, unfortunately, trusted to memory rather too often and got the odd fact wrong as the meeting wore on. Moreover, there simply was too much material to absorb in the manner it was presented. Committee members, for their part, tended to view the situation through their personal lenses of which hobbyhorse needed attention. This did not necessarily make for a broad view of TTC issues, and many erroneous assumptions, often uncorrected, crept into the debate. We will go through this and much more all over again at the November 23, 2015 meeting of the full Board when we can also expect a very long parade of deputations on the subject of fares. The entire exercise of having a Budget Committee has been useful, up to a point, in that some Commissioners have been exposed to the gory details, but they remain confused, and we have yet to see an actual philosophical discussion of just what the TTC should be as a basis for the budgets for 2016 and beyond.